We’d love your help. Let us know what’s wrong with this preview of Each Our Own Devil by Joel Bain. Abandoned. Adopted. Bullied. Orphaned. Disowned. Terminated. Rejected. Heinrich Juarez is Lucifer’s worst nightmare. Only, not for the reasons that one might expect. Heinrich is the saddest man in Hell, and tales of the miserable life he led in Cuba are spreading among his friends. Suddenly, Lucifer’s greatest fear is realized when the damned souls begin to believe their t Abandoned. Adopted. Bullied. Orphaned. Disowned. Terminated. Rejected. Heinrich Juarez is Lucifer’s worst nightmare. Only, not for the reasons that one might expect. Heinrich is the saddest man in Hell, and tales of the miserable life he led in Cuba are spreading among his friends. Suddenly, Lucifer’s greatest fear is realized when the damned souls begin to believe their torment is not severe compared to the torment Heinrich endured on Earth. To ask other readers questions about Each Our Own Devil, please sign up. EACH OUR OWN DEVIL brings its reader on a literary, emotional, action-packed journey as we follow the main character, Heinrich, through Cuba, Hell, and America. After a dismal, tragic life in Cuba, Heinrich finds himself in Hell, not really impressed by the horrors of it. Heinrich's misery causes sympathy by the others in Hell and Lucifer gets pissed, afraid that his order of chaos will be disrupted. In an attempt to get him out of his hair, Lucifer assigns Heinrich the task of doing his bidding EACH OUR OWN DEVIL brings its reader on a literary, emotional, action-packed journey as we follow the main character, Heinrich, through Cuba, Hell, and America. After a dismal, tragic life in Cuba, Heinrich finds himself in Hell, not really impressed by the horrors of it. Heinrich's misery causes sympathy by the others in Hell and Lucifer gets pissed, afraid that his order of chaos will be disrupted. In an attempt to get him out of his hair, Lucifer assigns Heinrich the task of doing his bidding on Earth and provides him with a spirit guide/demon, Mephistopheles, who will live within him. In New York City, these two work together to get things done for Lucifer and, without giving too much of the story away, I'll just say that things start to get crazy. As Heinrich experiences the emotions of those he's "helping" in NYC, his character becomes complex and layered, and his path is suddenly not so clear-cut. I can't tell you more! You'll have to read it yourself to find out. 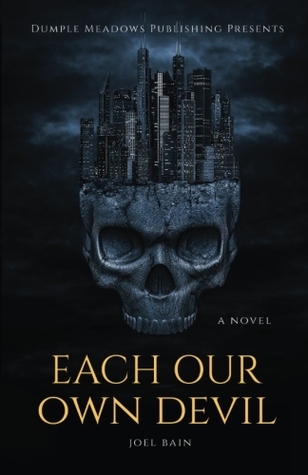 EACH OUR OWN DEVIL was a wonderful read--an intelligent, character-driven, action-packed look at good versus evil in the form of a known-world, supernatural fantasy. I highly recommend! Joel Bain tugs on the heart strings immediately, making the first part of the book an uncomfortable but compelling read. Heinrich's journey is a painful and emotional one that will have you invested in his path from the start. Bain plays on religious cliche's, adding his own flair and touch, creating a new feel to old biblical names. This novel is upsetting in all the right ways, making a reader stroke their chin as it plays into old rhetorics of right vs wrong, nature vs nurture, and fate vs fre Joel Bain tugs on the heart strings immediately, making the first part of the book an uncomfortable but compelling read. Heinrich's journey is a painful and emotional one that will have you invested in his path from the start. This novel is upsetting in all the right ways, making a reader stroke their chin as it plays into old rhetorics of right vs wrong, nature vs nurture, and fate vs free will. An immersive adventure in a supernatural thriller. This is the first-time I read in this genre and I found the storytelling to be riveting with fairly compelling characters. I very much enjoyed this novel! Despite it not being a genre I would typically go for, I am eager to read it again. Each Our Own Devil gripped me right away with its detailed, descriptive syorytelling... I could picture myself in every scene as I was reading it. The way the author imagines Hell was particularity memorable for me. The protagonist experiencing his highest highs and lowest lows left me feeling challenged and inspired, even when his harrowing journey was at its most intense points. I very much enjoyed this novel! Despite it not being a genre I would typically go for, I am eager to read it again. Each Our Own Devil gripped me right away with its detailed, descriptive syorytelling... I could picture myself in every scene as I was reading it. The way the author imagines Hell was particularity memorable for me. I love the concept of "sympathy for the devil" since it forces you to think complexly about the characters and, in turn, people in your own life. It's a sort of hyped up attempt at empathy that is truly fascinating when done well. Each Our Own Devil does just that. How can you sympathize with a murderer? How can you root for someone who would sell their soul to the devil for vengeance? This haunting and brutal story will not only make you hope for the saddest man in hell, but will also have you qu I love the concept of "sympathy for the devil" since it forces you to think complexly about the characters and, in turn, people in your own life. It's a sort of hyped up attempt at empathy that is truly fascinating when done well. How can you sympathize with a murderer? How can you root for someone who would sell their soul to the devil for vengeance? This haunting and brutal story will not only make you hope for the saddest man in hell, but will also have you questioning your own soul. Bain does almost too good of a job with his depiction of hell (as a hyper-sensitive, I had to make sure I read this book during the day!). His imagery is visceral and you can't help but be affected. There were a couple of small points I had an issue with, but they did not affect the story and were really open to interpretation. Also, his use of God in this story was incredibly well done. I'm always concerned when I read a story with God in it, expecting a sermon, but I never felt preached at. EOOD’s premise piqued my interest from the start, as I’m a fan of antiheroes and gritty, potentially tragic stories. I think it takes great courage to write fiction about matters of faith with both creativity and respect for real-world beliefs, but Bain takes this challenge on boldly. He has a story and a message, and he’s not afraid to tell them. Readers will find some familiar imagery throughout, but also some fresh takes on its supernatural themes. While there were several points I had issue w EOOD’s premise piqued my interest from the start, as I’m a fan of antiheroes and gritty, potentially tragic stories. I think it takes great courage to write fiction about matters of faith with both creativity and respect for real-world beliefs, but Bain takes this challenge on boldly. He has a story and a message, and he’s not afraid to tell them. Outside of the reviews posted for EACH OUR OWN DEVIL, I was unsure what type of story I was about to immense myself in when I picked up this novel. The truth: EACH OUR OWN DEVIL is far more than a dark fantasy. Joel Bain has written a literary narrative filled with suspense, impeccable character development, and a challenge to the moral code of human existence. Bain’s work will cause the reader to question motives and where to place their sympathies. EACH OUR OWN DEVIL exposes the reader to the d Outside of the reviews posted for EACH OUR OWN DEVIL, I was unsure what type of story I was about to immense myself in when I picked up this novel. The truth: EACH OUR OWN DEVIL is far more than a dark fantasy. Joel Bain has written a literary narrative filled with suspense, impeccable character development, and a challenge to the moral code of human existence. Bain’s work will cause the reader to question motives and where to place their sympathies. Joel Bain makes his home in Vancouver, Canada. His first novel, A BULLET FOR THE BRIDE, debuted in 2009, while his latest novel, EACH OUR OWN DEVIL, hit bookshelves in 2017. He started Dumple Meadows Publishing in 2008, delving into a variety of platforms including fiction and digital magazines in the pursuit of developing and encouraging aspiring writers. He formerly held the role of Editor-in-Chi Joel Bain makes his home in Vancouver, Canada. His first novel, A BULLET FOR THE BRIDE, debuted in 2009, while his latest novel, EACH OUR OWN DEVIL, hit bookshelves in 2017. He started Dumple Meadows Publishing in 2008, delving into a variety of platforms including fiction and digital magazines in the pursuit of developing and encouraging aspiring writers. He formerly held the role of Editor-in-Chief of Sour Grapes Winery from 2009-2014.